Figure 1: Composition of E. ocellatus venom, studied at both proteomic (A) and transcriptomic (B) levels (Wagstaff et al., 2009 ). Families tagged as “venom” are only detected by proteomic analysis, whereas families tagged as “transcr.” are only detected by transcriptomic analysis. 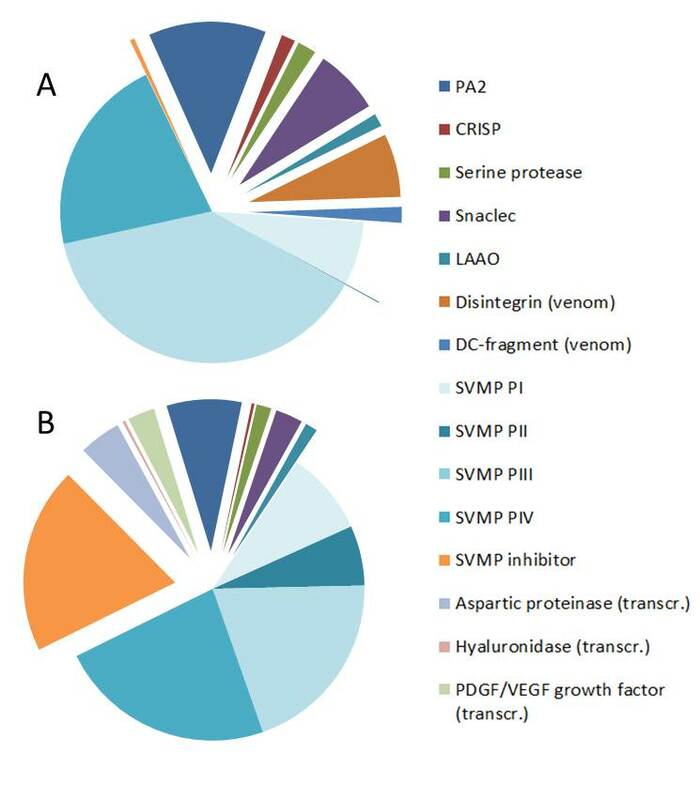 Concerning disintegrin and SVMP PII, it is probable that most disintegrins are encoded by SVMP PII and are thus only detected by venomic analysis, whereas SVMP PII are only detected by transcriptomic analysis. Hovewer, it is noteworthy that Juarez and colleague (2006) have described disintegrins encoded by disintegrin genes (and not only encoded by SVMP genes). PA2 (phospholipase A2 ), CRISP, serine protease (peptidase S1 ), snaclec (C-type lectin-like) , LAAO (L-amino-acid oxidase also known as flavin monoamine oxidase family ), disintegrin, DC-fragments (disintegrin/cysteine-rich fragment from PIII SVMPs), SVMP (snake venom metalloproteinase ), SVMP inhibitor, aspartic proteinase, hyaluronidase (glycosyl hydrolase 56 ) and PDGF/VEGF growth factor. Lethal dose LD(50) is 1.005 mg/kg by intravenous injection into mice (Laing et al., 1995 ).